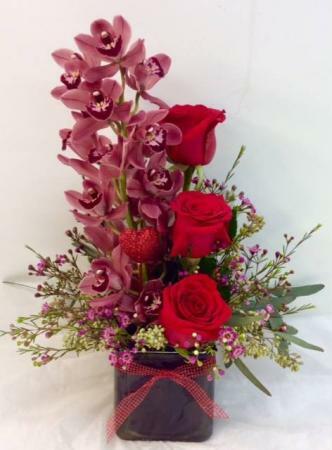 Show your love and appreciation with this purple glass cube filled with a gorgeous cymbidium orchid, premium red roses and fragrant wax flower. 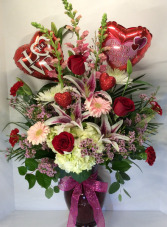 This amazing arrangement is a show stopper! 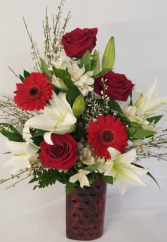 It is a large red glass vase filled with stargazer lilies, snapdragons, gerbera daisies, premium red roses, red carnations, white Fuji mums, a white Hydrangea and pink wax flower. It also includes sparkly heart picks and two 9” Mylar balloons.